My earliest memory of driving a Nissan was buying a locally built Primera. It felt good to buy a car not only that was made locally but it was built as if it were made in Japan. The car was as dull as dishwater but its excellent gearbox and all-round reliability made this car something I really grew to like very much. The car I have driven this month is the Nissan GT-R and having driven this car over six years ago, I can’t even begin to explain just how much I was looking forward to driving this beast once again. The very ﬁrst GT-R came out in 1969; this 2lt mean machine wore the Skyline badge. A coupe version followed in 1971 and a replacement model came out in 1973, limited to just 197 cars. That was the end of the Skyline name until 1990 when Nissan decided to enter racing and the marque was reborn. This brings me on to the latest most recognised version of the GT-R the latest incarnation of this Japanese supercar has become even better than the excellent car I drove those six long years ago. In my last review a friend of mine had just bought a GT-R but due to her becoming a grandmother recently she has sold the car. As a treat I decided to take her out for a spin in the GT-R I had and she was tempted to go straight the garage and order one. If she does I want a commission, guys. Nissan have made only subtle changes to the car but it’s really a force to be reckoned with. From what I remember the only changes I noticed on the outside of the car were the LED lights incorporated into the front bumper. Any GT-R buffs please excuse my ignorance if I have missed out anything else new, but I didn’t notice it. The car has a drag co-efﬁciency of 0.27 making the car very sleek. If you haven’t seen a GT-R before you can’t help but notice the massive tyres and the huge rear exhaust pipes, it could quite easily be a Batmobile. Driving this car you realise just how big and muscular the car actually is, driving around town or along narrow roads can be scary for the inexperienced. Ordering the GT-R in Nismo mode makes this car even more focused and performance tuned but will set you back an eye watering £120,000. The other new version available is the Track Pack GT-R this is an extra £10,000 over the standard car but it is a much more track focused car with ﬁrmer springs, lighter Nismo wheels and improved brake cooling. The rear seats have been removed and combined with the new lighter alloys helps save 20kg in weight. If I am being totally honest I personally think the standard GTR is amazing value and I don’t think the extra 10k makes the already fantastic car any better at all. Anyone used to a Porsche 911 will ﬁnd the interior quite an afterthought. It seems as though the designers really knuckled down with the exterior design and the engine but they left the cars’ interior to some young novice. The dash is dominated by a screen which not only has an array of options and data read-outs but has so many buttons it can be quite bewildering. The interior trim and plastics are really very cheap and pretty nasty. I’m sure in my last review I likened the plastic to recycled Bic pens and the screen was like something from Dixons. 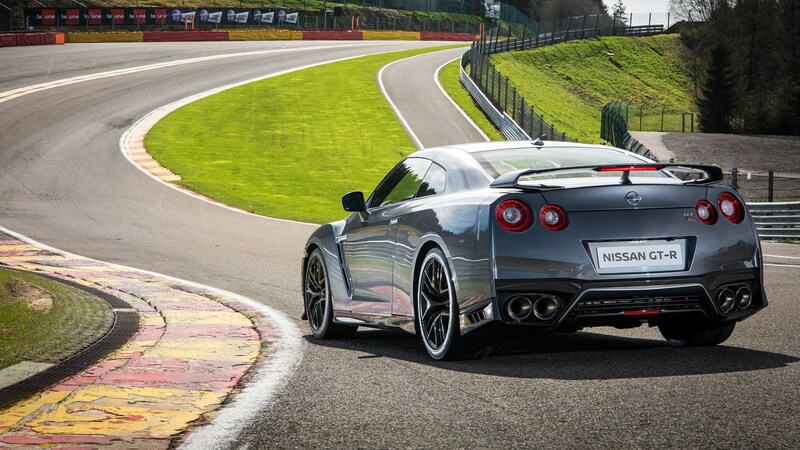 Fans of the GT-R will no doubt say the car is about the performance and handling. With that in mind it has to be said this car is unbelievable on both counts. The standard model has 523bhp and it gets to 60mph in a mind boggling time of less than three seconds and thanks to the excellent four-wheel drive the car feels glued to the road. Each engine is bench tested at full revs for 10 minutes and the tyres are ﬁlled with nitrogen as air is just too unpredictable. The dual clutch gearbox is as good as Porsche’s PDK box. The GT-R’s gearbox can be adjusted from snow mode to R-mode. This changes the shift speed and pattern. In R-mode the engine runs to the limiter. This setting is ideally suited to the track. Parking the GT-R can be quite nerve racking as the slightest touch of the throttle and the car lurches forward. If you perform a three point turn when the car is cold you will hear a great deal of noise from the front differential. Despite driving the car in comfort, I still found the ride very harsh around town or at slow speeds. The standard car has two rear seats which are really only useful for young kids and if a six foot driver sits in the front there is virtually no space in the rear at all. The boot has plenty of room for two sets of golf clubs, so keen golfers will be happy as they have space galore. The car comes with a three year or 60,000 mile warranty and it needs to be serviced every 6000 miles. If you do want to buy this beast it may be advisable to purchase the servicing pack which will save you money over the ownership of the car. 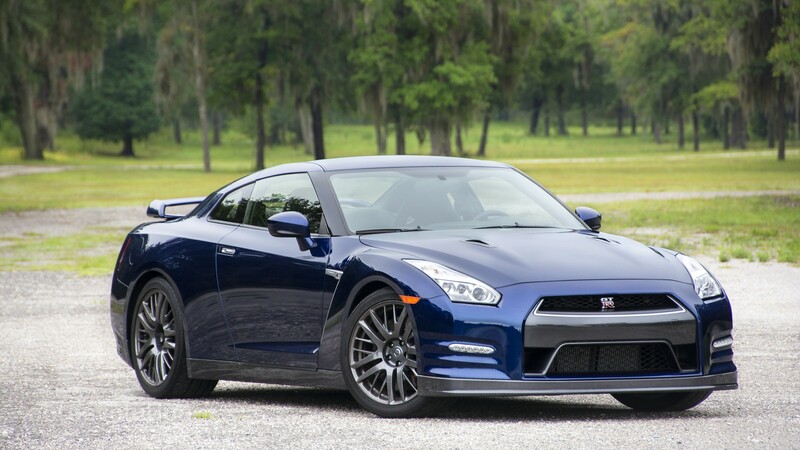 The GT-R really has to be the most value for money supercar on the market. It has the power and pace to keep up with Porsche and Ferrari but on tricky roads the car makes you look like a formula one driver. Just as I was about to ﬁnish this review I noticed Nissan showcasing the new 2017 GT-R in New York. Once again it’s hard to notice the differences on the outside but thankfully the designers have given the interior a real once over. I can’t wait to drive it and let you know my thoughts again.